Your exhaust system might not seem like the most likely target for theft. For one, it’s heavy – a complete system is a mass of stainless steel pipes, mufflers and catalytic converters. For another, it’s underneath your car, which is not exactly the easiest place to get at without jacking or otherwise lifting the car up off the ground. All of these reasons probably make you feel pretty safe when walking away from your parked car. After all, who would want to steal an exhaust system anyway? It turns out that there are actually quite a few people out there who have their eye on what has turned into a lucrative segment of the car theft market. These would-be thieves aren’t looking to relieve you of your entire exhaust system, or even your muffler. What they are after is the catalytic converter, a part you probably never even think about until it comes time to replace it. The catalytic converter breaks down the exhaust gases produced by your engine into their harmless component gases, such as nitrogen and oxygen. The converter is usually a large, tubular device made of steel, and it can be located anywhere along the exhaust line. Why would someone go through the effort of removing such a heavy, specific component, at great risk to themselves of getting caught red-handed under someone else’s car? 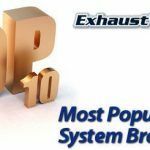 While most car parts are stolen in order to be re-sold to those looking to use them in their own cars, that is not why catalytic converters disappear. Converters contain rare, precious metals that are vital to their operation. The exhaust gases are ‘converted’ by exposure to a very thin coating of platinum, palladium and rhodium that lines the interior of the device. These metals are very expensive. Platinum is sold for around $1200 per ounce, whereas rhodium can cost as much as $6000 per ounce. Thieves generally sell their catalytic converters to scrap yards or other metal buyers for under $250 each. The metals are then extracted and sold for a large profit. What are the most common methods for a thief to get at these valuable parts? 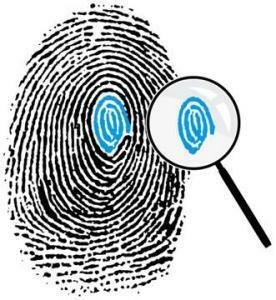 Usually the robbers target poorly monitored storage yards or warehouses so they can score many parts at once. However, some thieves are quite brazen and it is no longer unusual for police to encounter cases where a car’s catalytic converter was stolen while the vehicle was parked in a public parking lot or even the owner’s driveway overnight. The tools of the trade are simple: a pry bar, a rotating saw and a jack. 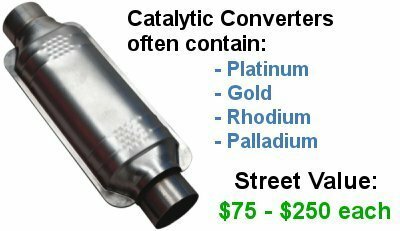 Obviously, given the cost of these metals, replacement catalytic converters are not cheap. This can be compounded by the fact that many cars have more than one converter installed – usually a maximum of four. Depending on the type of car that has been victimized, it can cost thousands of dollars to replace all of the converters, including the time your car spends in the shop. There is no foolproof way to protect your car from this kind of damage, but there are some precautions you can take. If you have a garage, park your car in it overnight instead of leaving it in the driveway. When parking outside, make sure that your car is in a heavily lit, well-trafficked area where it will be hard for a thief to conceal his actions or equipment. Install a vehicle alarm system with a shock sensor.